Kenny 'Bob' Marin seems an unlikely candidate to be an Oddjobber, let alone anything besides a couch potato or perhaps sideshow attraction. Bob firmly believes in the ancient Earth religion of Rastafarianism and has incorporated it's practices into his everyday life. While this alienates some, and horrifies others, it has suited Bob well. 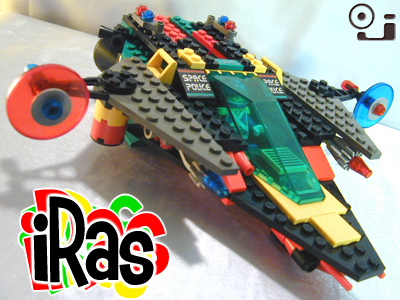 Initially a mechanic turned smuggler, Bob eventually scavenged together an old Warhawk I chassis, modifying and mangling it into his personal starcraft the iRas. Believed to be the beneficiary of no less than half a dozen decommissioned Warhawks, the iRas incorporates oversized gravitic dampeners in place of the common laser lance apertures. While retaining the legendary Warhawk sturdiness, the iRas is more nimble and quick than any Warhawk should be. Due to his competence in smuggling, Bob became and excellent courier and covert reconnaissance operative. Despite a penchant for blaring bass heavy dub wherever he goes, Bob has an almost chameleon-like ability to go unseen when he wants to. He claims it's just a state of mind. And his mindstate is what makes him so valuable and unpredictable. Bob claims to operate at his best when "completely blown off my gourd!" While Oddjobers can't condone it, we are forced to agree his unorthodox methods have garnered positive results time and time again. "We actually blew a processing unit trying to analyze his flying pattern, the only concrete trend we could discern in his performance was a tendency to do whatever would most flummox the computer." "Like, Bob is completely righteous..."
"Marin bypassed our entire security system, caught me alone, unarmed, and completely off guard to return a data plaque I'd left at a bar. How can you not offer someone with fajooties like that a job?"